in 2014, an estimated 3.18 million people live in SEQ (Greater Brisbane, Gold Coast and Sunshine Coast), which is 67.1% of Queensland’s estimated population of 4.74 million. in 2036, a projected 4.90 million people will live in SEQ, which will be 69.0% of the Queensland population of 7.10 million. Treasury, of course, will argue that its projections are based on current policy settings and that they don’t take account of any policy measures that may be aimed at reaching the Queensland Plan target, which is true. However, given the existing trend is toward greater concentration in SEQ, it’s hard to see how Government policies could shift nearly 20% of the State’s population from SEQ to the regions. The Queensland Plan target would imply that some 1.3 million people would choose to settle in or re-locate to regional Queensland instead of SEQ, as a result of Queensland Government policies to promote the regions. This sounds highly implausible. The regional population target in the draft Queensland Plan is unachievable and should be scrapped. 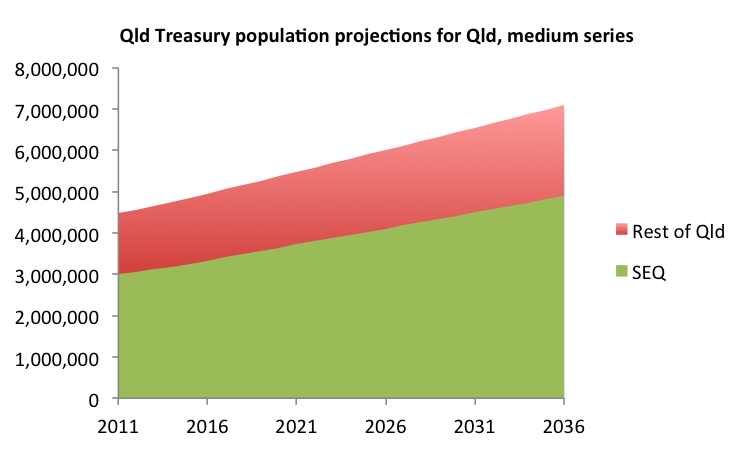 This entry was posted in Population, Queensland Government and tagged population, populationprojections, qld, qldtreasury, queensland, regionalqld, seq. Bookmark the permalink. Just because you think a target is unachievable, doesn’t mean it should be scrapped. Geez, the more unachievable, the more enticing the target. The problems I see with Treasury’s forecast is the graphs are linear – I think it will be a lot more complex than that. I think there will be a population shift to the regional areas. The population of SEQ may continue to grow, driven by the services and facilities the SEQ corner has over it regional counterparts. However, liveability will eventually drive a shift to the regional areas. Brisbane city CBD will be populated by a very Asian middle class with their apartment living and $5M visas. The Brisbane suburban population will become increasing frustrated with transport, and liveability and rising housing prices and find regional area more and more attractive. This is already occurring with the growth in Toowoomba, Sunshine Coast, as early retirees move out of the city. This is not shown in the statistics I suspect, because most still hold onto their Brisbane property as a city base. A marginal increase and innovation in delivery of health, educational, the arts, and transport services to regional centres such as Nambour, Gympie, Rockhampton, Caloundra, would create a tipping point. Especially for those Queenslanders who yearn for a bit of space for their children to grow up. Regional areas do have a wonderful lifestyle. Services certainly shows signs of being able to be innovatively delivered. For instance , I’ve been wearing my UP Health and Fitness activity monitor since Christmas. It will only take a Release 2 or 3 upgrade before these devices are full health monitors that plug-in to remote tele-services and video consultant conferencing. Project Puccini, and the like, will assist to grow Arts and entertainment in Regional areas. The great fear of city populations is ‘fear of missing out’ once they move to a Regional area. I think there is a tipping point where regional living will provide a happier and healthier lifestyle to city living , and that point is not to far away with a bit more create thinking. I think a big push should be made to reach the targets ! Haha, Katrina, I must admit I’ve been enticed by some unachievable targets in the past. I agree the actual population changes will be more complex than the Treasury projections, but I can’t see how Government policies can do much to offset the strong attraction of SEQ, given the wide variety of economic and social opportunities SEQ provides. Thanks for alerting me to Project Puccini, too. I may have to blog on what a waste of money it is one day. Economists and Engineers – certainly see things from vastly different perspective. I do enjoy the economic thought bubble you provide in your blog – it gives me something to ponder as I walk to and from the gym . Could you wait on the Project Puccini blog until after I have auditioned. Thanks. “The more unachievable, the more enticing the target”. Also possibly any policy to achieve that target more destructive? Can’t help it I went through the Deming school on how targets are actually counter-productive. Still not sure why there should be any policy to encourage people to live where they otherwise would not?